20. Who's Been Polishing The Sun? Ambrose’s was the deluxe dance band orchestra of its time. There are numerous ways to approach its legacy and you can break things down by record labels. My first large-scale encounter with the recordings came via a Decca Vintage series gatefold LP which focused on recordings made for the label between 1933 and 1939, though there was a strong concentration on the years 1934-35. Then you can go further back to its pre-Decca HMV days. This is the comprehensive approach taken in this twofer allowing a 16-year span of recordings that allows one to eavesdrop on the long sequence of HMVs as well as the interregnum years of 1932-33 when the band turned up on Regal Zonophone and Brunswick, before the inauguration of that long Decca contract. Unlike the jazzier Lew Stone, Ambrose could luxuriate in romantic balladry, a commercial trait emphasized by the appearance of at least two fiddlers on a number of tracks; occasionally he even sported more. But he also employed some of the best instrumentalists of the time; Sylvester Ahola, Max Goldberg, Tommy McQuater, Ted Heath, Lew Davis – along with George Chisholm (also in Ambrose’s ranks for a while) Britain’s finest trombonist of the 30s - Danny Polo, Sid Phillips, Harry Hayes and a host more. 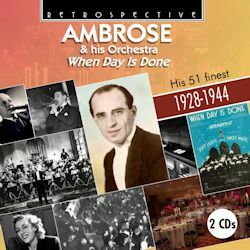 Ambrose also had the advantage of Britain’s most popular male vocalist until the arrival of Al Bowlly, namely Sam Browne, and the arranging skills of Lew Stone until he left in the early 30s to take over the remnants of Roy Fox’s band. The tracks feature prominent vocals and moments of individual finesse from the soloists and sidemen. The hotter numbers – Hors d’oeuvres, Embassy Stomp (a Bert Barnes piece graced by his brilliant stride piano solo) and Cotton Pickers’ Congregation (a Sid Phillips tune) – are famous examples of the band firing on all cylinders. They play with great sensitivity in Ellington’s Caravan and in Deep Henderson. Ahola often soloed muted as did Heath inLazybones and there’s a striking and long violin solo in The ‘Free and Easy’; I assume it’s taken by Eric Siday. Phillips turns Duke-ish in B’Wanga and there are maracas to be shaken in the rumba from A Cuban Suite written by Don Marzedo. The beautiful, talented Connee Boswell shows her effortless style in I'll Never Say 'Never Again' Again and during 1935 there are strong signs that someone has been listening to Benny Carter’s saxophone voicings; listen to Copenhagen. By 1936 the brass section, in particular, was absolutely top-notch and in Eric Breeze, Les Carew and Lew Davis the band sported the finest trombone contingent in Europe. The band still mined some corn – Valkyrie quotations et al - as well as sentimental ballads, such as provided by Vera Lynn, as I write the only survivor of the 1937 band, in Moonlight on the Waterfall. I’m fairly sure that this is another in the sequence of ex-Living Era releases that Retrospective has reissued in its uniform livery, so if you have that much earlier release you’ll notice only some variation in track ordering and, of course, new artwork and notes. If you have the Living Era, you won’t need this. But this is a good twofer to own and contains the very best of Ambrose.